Join MASA members for an advocacy day. 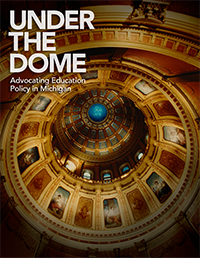 MASA Under the Dome will include a briefing on current state legislation and issues related to public education, presentations on hot topics that impact public schools, a training session on how to effectively engage with legislators, and a luncheon with staff members and lawmakers. Upon conclusion, MASA members are encouraged to schedule appointments with lawmakers to discuss district-specific issues. We ask that you not schedule meetings during the structure part of the agenda.